METAL MANIACS And METAL EDGE Magazines Closing Their Doors? 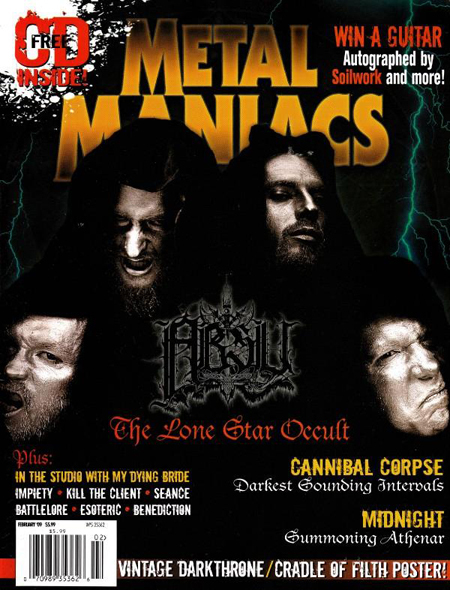 Several writers for Metal Maniacs magazine have reported receiving word yesterday (Tuesday, February 3) that both Metal Maniacs and its sister publication Metal Edge have shut their doors effective immediately, with one more issue of each title still set to come out. It should be noted, however, that the two magazines' publisher, Zenbu Media, has not yet officially corroborated this information. Metal Edge and Metal Maniacs, two of the leading heavy metal magazines in the U.S., have been publishing for 24 years and 19 years, respectively. The two publications were acquired by Zenbu Media in February 2007. Covering bands across the hard rock spectrum — from classic metal to thrash to punk — Metal Edge is considered a leading voice in the mainstream metal media. In existence since 1985, Metal Edge was published twelve times a year — providing in-depth coverage of current musical acts, including band profiles, news of the latest releases and coverage of the biggest tours. Metal Maniacs has given exposure to the best underground metal bands. Scouring the globe for the greatest unheard-of artists, Metal Maniacs has, for nearly 20 years, provided one of the few outlets for these acts and a way for fans to unearth the greatest unheralded hard rock outfits. Based in New York City, Zenbu Media is a music-oriented multi-pronged media company that specializes in print, digital, events and recordings.